Happy St George's Day everybody! Isn't it weird that this day is so widely ignored these days? What happened to St Georges Day? Where are all the Morris dance displays and folk music celebrations that used to go on when I was little? One theory is that in England we don't like to appear nationalistic, that it might go against our wonderful mixed cultural heritage of today, and the fact that the Flag of England is seen to have many negative connotations attached to it now. Even so, the fact that St Patrick's Day is so widely celebrated in England makes this even more strange, we don't seem to mind celebrating other countries national days! What really fascinates me is that St George was not actually English at all. He was believed to have been born in Turkey, he grew up in Palestine, and later became a Roman soldier. He seems to be the perfect example of all an English Saint should be in today's modern times; multicultural, multinational and very brave. So with that in mind, I think st George's day is far from being nationalistic. It celebrates the very opposite; this multicultural wonderfulness that we have today and that I myself am proud of. In fact what it all comes down to really, is an excuse to get together and eat. Historically St George's day was celebrated as a national feast day. So I say lets make this day all about the food (no surprise there), and bring back the tradition of celebrating this feast day. With lots of food, friends, family, dancing and laughter it could have all the makings of a wonderful celebration- like Christmas, but without the endless marketing and gift buying. As I'm right at the start of a bit of a Spring cleanse, I wanted to make a traditionally English dish that I could still actually eat. Famous for our heavy pies and cream laden desserts this presented a bit of a hurdle for me, but then I came up with this new version of scones and jam which really is a win win. 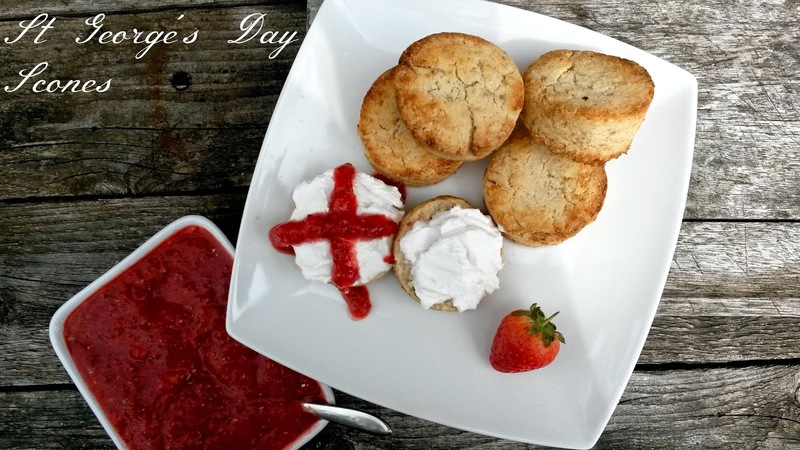 Scones are not only a super traditional food, when topped with the coconut yoghurt and red jam, they represent the colours of the St George's cross. Although these scones look just like the original, they contain no sugar, no gluten, are vegan and paleo friendly and the jam is all raw! First preheat your oven to 170 degrees (fan). Add all the scone ingredients to a bowl and mix with your hands to create a knead-able dough. Just like with traditional scones, don't overwork the mixture! Press the dough into a rectangle shape about 2.5cm (1 inch) thick, cut out 5cm diameter rounds and place on a lightly oiled baking tray. Brush the tops with almond milk and cook for 15 minutes until golden on top. While the scones are cooking, blitz the strawberries, vanilla stevia and chia seeds in a food processor until you have a jam like consistency. Put aside to thicken up. When the scones are ready (you can test by tapping the bottom of the scone, it should sound hollow), cool them on a rack. When cool, cut in half and top with coconut yoghurt and the strawberry jam. Yummy!